Welcome back to another week in gaming history. For the week of September 22nd through the 27th, we're taking a look at Myst, E.T, and two games that established massive multiplayer online gaming long before the current buzz of Warhammer Online and that well established behemoth "other game" was a twinkle in anyone's eye: Meridian 59 and Ultima Online. Debuting this week in 1993 on the Macintosh, a sleeper hit named Myst captured the hearts and attention of gamers and mainstream media. The game was buggy, yet beautiful, complicated and compelling, and showcased CD-ROM technology in all new ways. 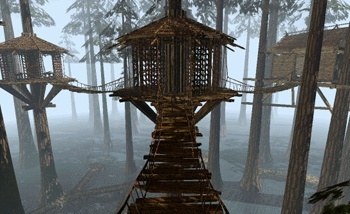 A thirteen-year saga spawning an entire series of games, Myst's final chapter appeared in 2005 with the appropriately titled Myst V: End of Ages. Uru: Ages Beyond Myst , which later becoming the online Uru Live never quite made it out of beta and closed "for good" in April 2008. In late June of this year, developer Cyan Worlds indicated that Myst Online could return at some point as the Myst Online: Restoration Experiment, but the future is still questionable. Beating the better-known Ultima Online to market by nearly a year, Meridian 59 made its debut on September 27, 1996. With a hack and slash, sword and sorcery setting, it was first published by 3DO and picked up by Near Death Studios after its original demise in 2000. Near Death Studios re-released the game in 2002, and it has been running ever since. Ultima Online made a sparkling debut a year later on September 25th, 1997, introducing many to the MMORPG genre and helping to open the market for many games to come. In the few short years following UO's debut, EverQuest (1999), Asheron's Call (1999), and Dark Age of Camelot (2001) appeared, and dozens of other MMOGs went into early stages of development. UO has spawned many regularly released expansions although the player base has been considered to be in 'slow, steady decline,' with the next official expansion set for release sometime next year. 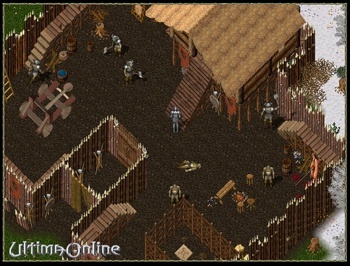 Although there have been efforts to "improve" UO's graphics over the years, a strong portion of the player base has resisted change. When the 3D client (Third Dawn) was considered a complete failure (and being kind, it was somewhere beyond ugly), EA abandoned support for it and shifted attention towards the Kingdom Reborn client, which was written in 3D but made compatible with 2D in order to maintain the game's retro feel while giving it a more modern look. Finally, to round out the week, drama and outrage emerged in 1983 as the city of Alamogordo blared headlines such as "City to Atari: 'E.T.' trash go home'" with reporter M.E. McQuiddy following the story in a series of articles. The story had people shaking their head in disbelief for many years - could one game be so bad that it was shipped off to a landfill, in hopes that it would be forgotten? Oh yes, it was. Every hideous word you read about how bad the gameplay was is true, leaving many affected youngsters to experience their first true videogame disappointment. Suffering from a massive quantity of unsold merchandise, well-deserved panning of the game itself, and an expensive IP it had no hope of seeing anything resembling profit from, Atari executives took a literal approach to sweeping the whole mess under the rug - or, in this case, pavement. Movie tie-ins still aren't very good, but it is safe to say some of the lessons of the past have been learned - none of these games have ever been considered quite as disastrous as E.T.